Pinpoint Commercial - Olmsted-Kirk Paper Co.
At PinPoint Commercial, we believe that it takes rich, diverse backgrounds and industry leadership to help our clients succeed. This is why our team uses a hands-on management approach on every project. And, we deliver precisely executed results through the assembly of the right teams, processes and tools to ensure the success of your project. The depth and breadth of our personnel offers you experienced resources from support staff to our partners and principals. Olmsted-Kirk Paper Company has been distributing fine paper products from its Houston distribution center at 3840 12th Street for over 40 years. 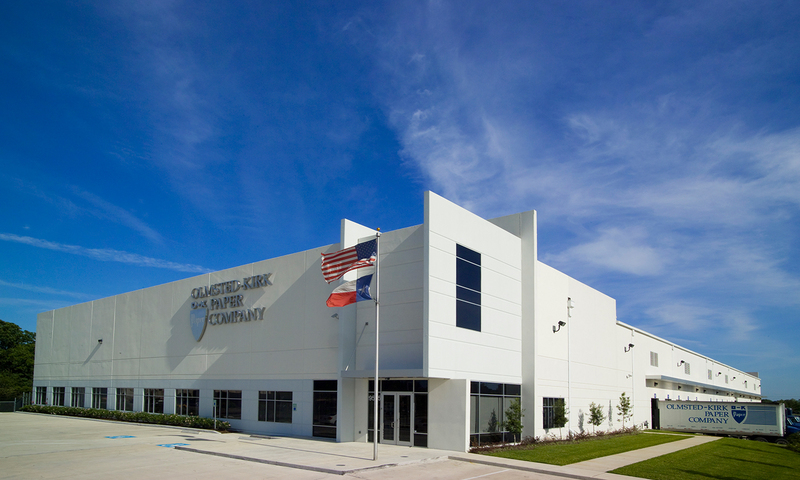 The company’s success in Houston created a need for more storage and distribution capacity. The options included off-site storage at another building, expansion of the 12th Street facility or acquisition of a larger existing building. After finding a temporary solution for their off-site storage needs, PinPoint Commercial went to work, analyzing the options for O-K Paper, keeping in mind the need for larger, more efficient storage space at a manageable cost. Based on its knowledge of the industry and marketplace, PinPoint Commercial helped its client determine that expanding the 12th Street building was not economically viable for a number of reasons. Assisted by PinPoint Commercial, O-K then attempted a thorough and lengthy market search but failed to locate a suitable existing building to purchase. After determining that there were no efficient existing options in the market, the team at PinPoint Commercial found a land site in the required geographic area ideal for the construction of a new, state-of-the-art distribution building. PinPoint Commercial coordinated the site acquisition, building design team and construction process. PinPoint Commercial will provide permanent financing assistance as well. "Our company has relied on the market knowledge and experience of the team at PinPoint Commercial for over ten years in Houston. PinPoint Commercial has always handled our real estate affairs as though they are partners with O-K Paper Company."